One fearless teen decided to use social media to show bullies they weren’t breaking her spirit down. Nineteen-year-old Ciera Swaringen was born with a rare skin condition, giant congenital melanocytic nevus, leaving her body covered in growing moles and birthmarks. That kind of courage and confidence is the definition of beauty. “I’m so proud to be different, and at the end of the day, we all have something about us that’s unusual, whether it’s on the inside or the outside,” she said in her interview with HotSpot. No one deserves to be bullied, and seeing young women like Ciera stand up in such a brave way makes us seriously bow down. “My birthmarks are constantly growing and I often get new ones, but I’m hoping that will slow down as I leave my teenage years behind,” she said. “Sun-cream is like my best friend. I have to be extremely careful to make sure I’m protected on hot days. I use high-factor cream and don’t spend too much time in the sun. Most people in Hollywood try to hide their flaws, but Los Angeles actress and filmmaker Paige Billiot is putting her birthmark front and center. Billiot was born with a port-wine stain on her face, which affects three out of every 1,000 people. Although it’s not fully understood what causes them, one theory is that there’s a problem regulating blood flow in the capillaries, so blood vessels don’t constrict normally and stay permanently dilated, according to the Vascular Birthmarks Foundation.That creates a permanent pink, red, or purple patch of skin. There’s no cure for port-wine stains. Some use pulsed-dye laser treatments to lighten them (although they can come back) or heavy-duty makeup to camouflage them. 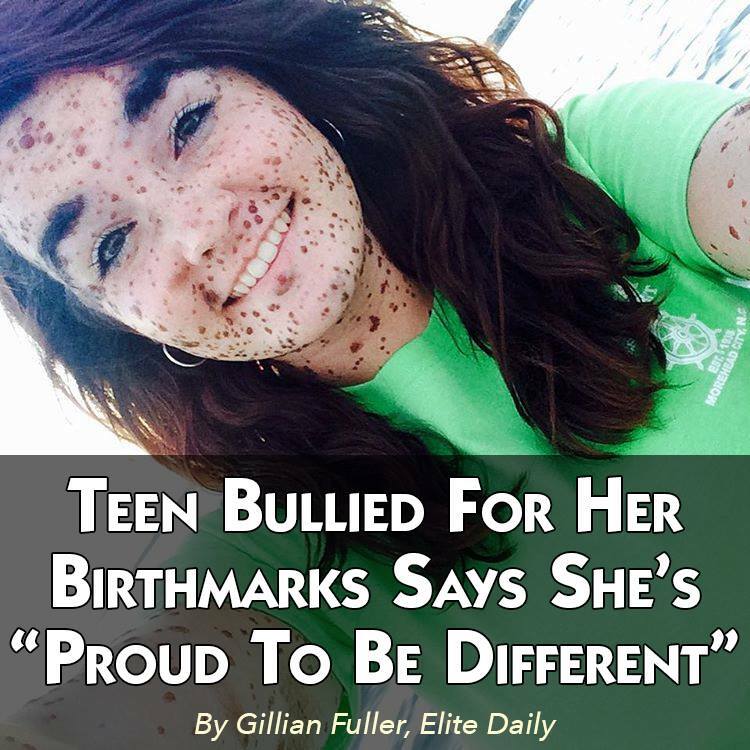 Billiot proudly embraces her birthmark and doesn’t try to hide it. But it wasn’t always that way. 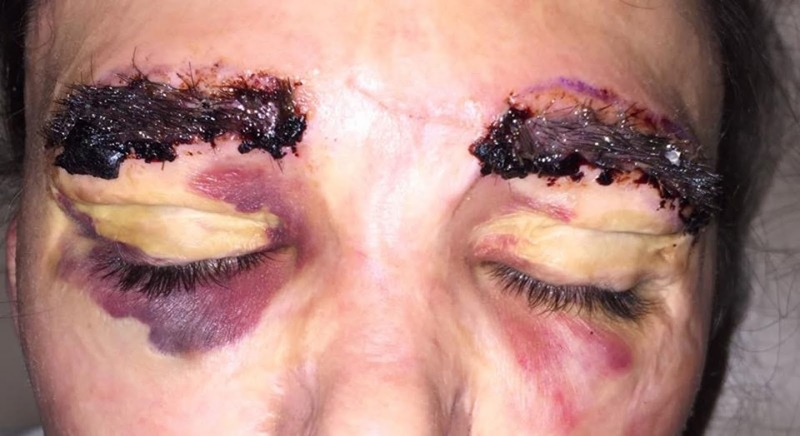 WHEN Giorgia Lanuzza wears her bikini, she desperately hopes people will gaze at her body – even though 97 per cent of it is covered in painful red scabs. 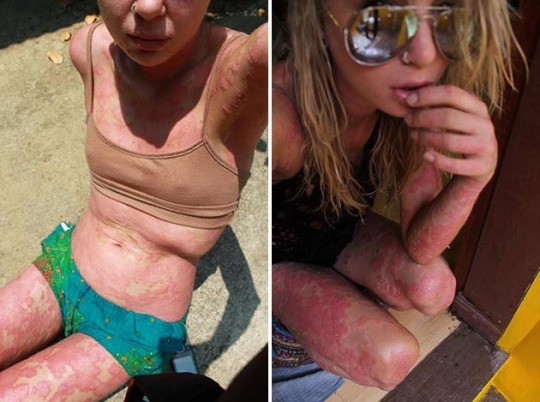 The 24-year-old suffers from psoriasis and endured years of name-calling and shame before deciding to refuse to hide herself away any longer. But throughout her teen years and into her 20s, the project manager would cover herself in layers of clothing to hide the inflamed blotches. 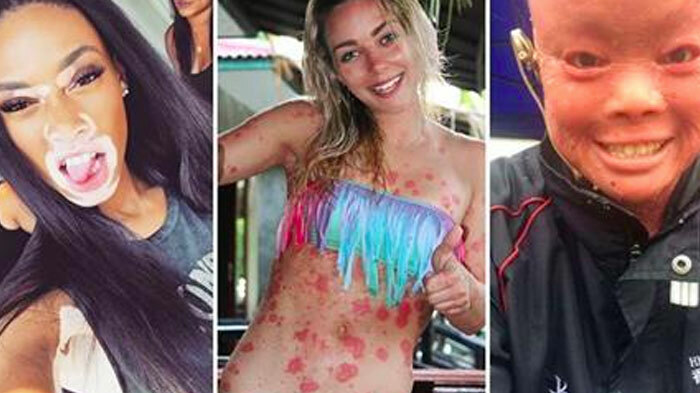 She said: “My psoriasis looks like red, raised spots and people looked at me as if I was disgusting and they might catch something. People would stop and stare at me in the street. There is no cure for psoriasis, which affects two per cent of people in the UK and which becomes worse in heat or stress. Just this year, gutted Giorgia was forced to cut short a six-month trip to Thailand when she realised she could only go out in the tropical sun for ten minutes a day. Now that disappointment has spurred her on to vow she will no longer let the condition rule her life. And she wants to start a campaign to prove her psoriasis does not make her any less beautiful. Giorgia, of Basingstoke, Hants, said: “Stressing about my flare-ups only made them worse, so now I look at my skin with a positive mindset. “Finally I’ve come to terms with my skin and realised that I am beautiful. Giorgia first developed psoriasis 11 years ago when her dad Giuseppe was killed in a motorcycle accident in Italy. He was just 46. PSORIASIS is a common long-term condition that causes red, scaly and flaking patches of skin, writes Sun GP Dr Carol Cooper. 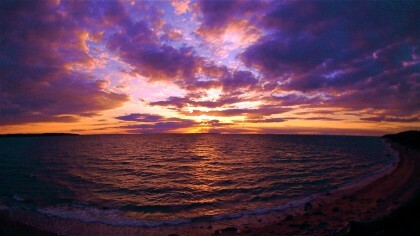 The patches can be small in size and number, but in some people they are more extensive and very troublesome. It is not contagious. 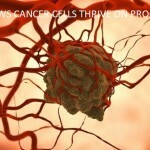 There’s no cure but there are many treatments that can relieve the condition, including some newer drugs for tough cases. Around one person in five with psoriasis develops arthritis – although it is a mystery why. Occasionally, joint problems can set in years before the person develops any patches of psoriasis. If these prove ineffective, doctors may opt for phototherapy treatment. It involves exposing the skin to certain types of ultraviolet light. 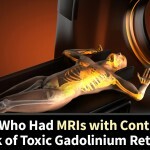 In the most severe cases, systemic treatments are used. 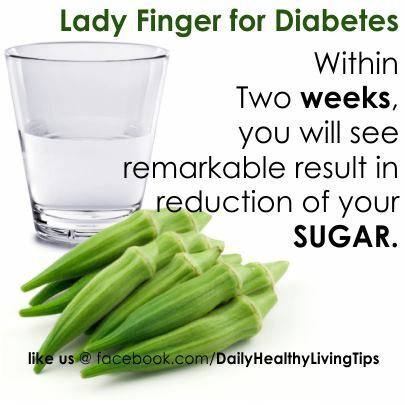 They are oral or injected medicines that work throughout the body. Having a pigmented skin has not always been the best experience but it is for Winnie Harlow! Winnie Harlow aka Chantelle Winnie is a top model who has a skin condition called Vitiligo. Vitiligo is a condition that causes depigmentation of parts of the skin. 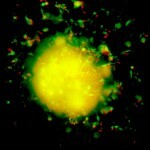 It occurs when melanocytes, the cells responsible for skin pigmentation, die or are unable to function. Winnie who was born Chantelle Brown has not always had it easy since she was diagnosed with vitiligo at the age of four. She admits she has been bullied where she went to school in Toronto with some of her classmates calling her Zebra because of the white patches on her face. She has since taken the fashion world by storm. Starring in two big spring/summer 2015 ad campaigns (Diesel and Desigual) and also walked for the Spanish designer, Desigual at New York Fashion Week. Rather than being judged for her distinctive looks, Winnie is now being celebrated for them. 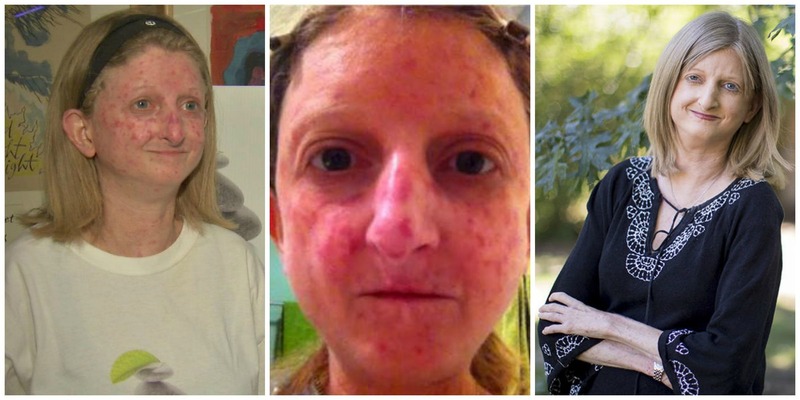 After 30 years of concealing her face from the world, writer Goodman-Helfand took off her makeup and shared an eye-opening, bare-faced selfie that showcases her symptoms of scleroderma, a rare autoimmune disease that causes a hardening of the skin. When Facebook refused to post the photo due to “negative feedback,” the internet fought back, and an awareness campaign, #SclerodermaSelfies, was launched. 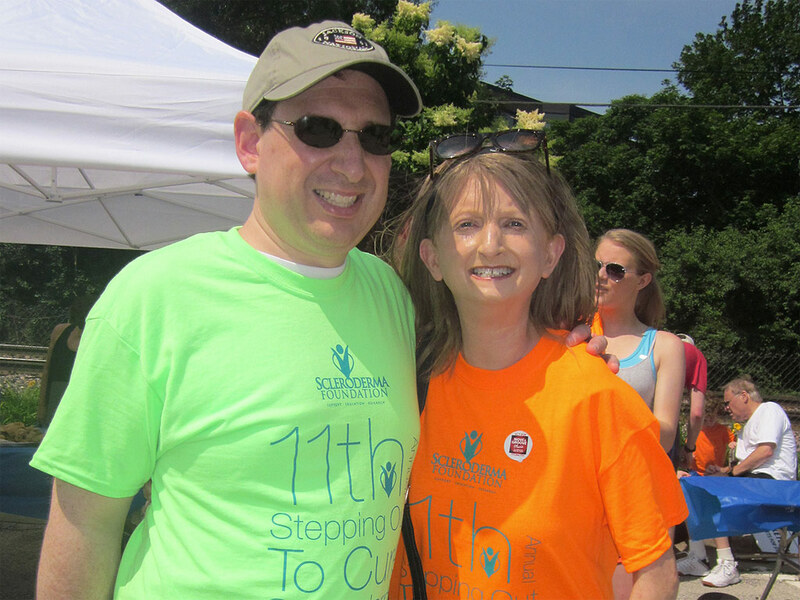 To learn more about how you can participate in the initiative, visit Goodman-Helfand’s blog Comfortable In My Thick Skin. ” I’ve devoted 29 years to concealing my face and finding clothes to best hide the rest of my insecurities. I know you’re probably picturing me as some crazy lady walking around with a bag over my head while wearing a potato sack dress. But, at first glance, if I’ve done my magic act well, you might regard me as just another average-looking 41-year-old suburbanite. I wish that were the case, but I suffer from a rare, chronic autoimmune disease called scleroderma. One symptom is the development of red splotches on the skin, telangiectasia. Upon diagnosis at age 10, these unsightly spots began emerging all over my body. By 12, I began concealing them with heavy foundation. My tenacious efforts to appear “normal” have taken a toll on my self-esteem. Being diagnosed with a disfiguring disease on the brink of adolescence was a devastating blow to my body image, and I grew up with a constant self-deprecating inner dialogue looping through my subconscious. I’m no psychologist, but I can’t imagine trying to hide every inch of your bare skin for 30 years can be a recipe for a positive self-concept. Thomas, 22, suffers from Harlequin Ichthyosism, a rare genetic condition that leaves her skin raw, thick, scale-like, and prone to infection. Despite the hurdles of her condition, Thomas has dedicated her time to speaking at schools, raising awareness about living with a “visible difference” and discouraging bullying. The school she attended required that she be accompanied by a educational assistant, which put up a barrier between her and the other children and made it difficult for her to make friends. Things got worse when she became a victim of cyberbullying. She began to deny her appearance, stopped bathing, taking her medication and applying the cream. At times, she considered jumping from the balcony of her home. “They’d say things like ‘You shouldn’t have been born’ — and very personal things that only people who knew me would know,” she says. The worst episode lasted for 10 months and only stopped after police became involved and found the bully — someone whom Mui thought was her friend. Mui left school with no qualifications. She says the school didn’t push her to study and made too many allowances for her skin disorder. “I still wish I had got a very hard kick up the backside from the teachers when I wasn’t doing work,” says Mui. Mui’s struggle to come to terms with her condition and other people’s reactions to it has, at times, left her on the brink of suicide. After she was abandoned at birth, long-time Hong Kong expats Tina and Rog Thomas began fostering Mui, when she was just one and a half years old. They were told she didn’t have long to live. Tina Thomas holds Mui aged 1-1/2 in 1994. “We wanted to give her a family life in the time she had,” says Tina. However, Mui began to thrive in a loving family environment and Tina and Rog formally adopted Mui when she was three years old. Together they gradually learned how to manage her skin condition. Each day she bathes twice, ideally for two hours each time, and everywhere she goes she carries a backpack with three or four tubs of cream that she must apply throughout the day to stop her skin from drying out. She’s thought to be the fourth oldest person alive with harlequin ichthyosis. The oldest is 31. Since leaving school, Mui has found a full-time job working with people with special needs and at weekends can be found running around a rugby pitch with a whistle — she’s a referee for kids’ matches. Along with her parents, she’s also begun speaking about her experiences of living with a “visible difference” and cyberbullying at schools around Hong Kong. Her father has also written a family memoir called “The Girl Behind The Face”. Many have found her story inspirational — a real life version of the young adult novel “Wonder” by R.J. Palacio about a young boy with a deformed face who enters middle school. In April, she graduated from school assemblies and spoke in front of a paying audience at a TEDx talk in the city. Tiffany Posteraro lives in Brooklyn, New York, says she first noticed her skin condition on her knees when she was 7 years old. She has vitiligo, a skin condition that causes pale patches to appear on skin as a result of low melanin. For 17 years, 24-year-old Posteraro wore thick makeup on her body to cover up the pale patches on her skin caused by vitiligo. Fed up with feeling like she has to explain her condition to onlookers, she had “It’s called vitiligo,” tattooed on her arms. “[I decided] to answer the questions in their heads and give them something to actually stare at,” she explained. Later, she looked up the condition online and discovered she “wasn’t the only person in the world with this condition”. As Posteraro’s skin condition grew and the white marks appeared across her body, people would make cruel comments and stare. “When people stared and made nasty comments, I had no comeback because I didn’t understand my condition. But after years of hiding, she decided to stop covering up. In the UK around 1 in 100 people develop vitiligo. 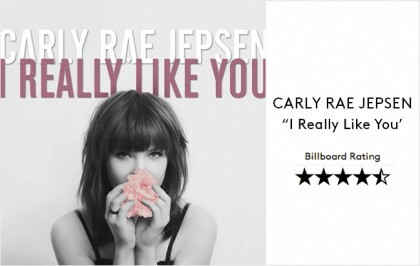 The entertainment industry can be ruthless and unforgiving. It is particularly important for a person to be physically flawless, but Cassandar Naud, a native of Alberta, Canada, decided to break stereotypes regarding how a person has to look. Cassandra has a birthmark on her face that is easy to spot. The mole, which is technically a nevus, extends from below the eye extending down to her cheek and is covered with hair. It is so prominent that sometimes strangers ask her about it. Cassandra doesn’t mind. There was one particular incident which she remembers, she was told by the casting agent to remove the scar from her headshots, digitally. At first, she was ready to oblige, in order please. But later, she opted out of it. She refused to change who she was, and give in to the demands of the entertainment industry.She is not ashamed of it because she knows that it’s this mark on her face that sets her apart from everyone else. 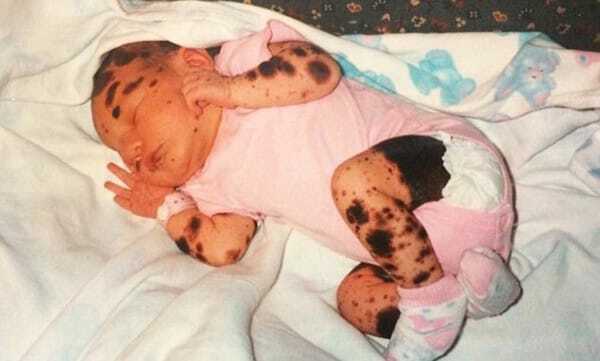 Her parents were given the option to remove the birthmark right after she was born, but they were concerned that it might be dangerous, and she might be left with a scar on her face. While growing up, she was bullied and considered having surgery to remove it as a teen. Eventually, however, Cassandra overcome all hesitations regarding the uniqueness of her face. While most people are anxious about their looks, Cassandra’s unique look had, in fact, further boosted her conviction to strive for her dreams. A burn survivor who once battled suicidal thoughts has learned to accept her scars and plans to become a motivational speaker. 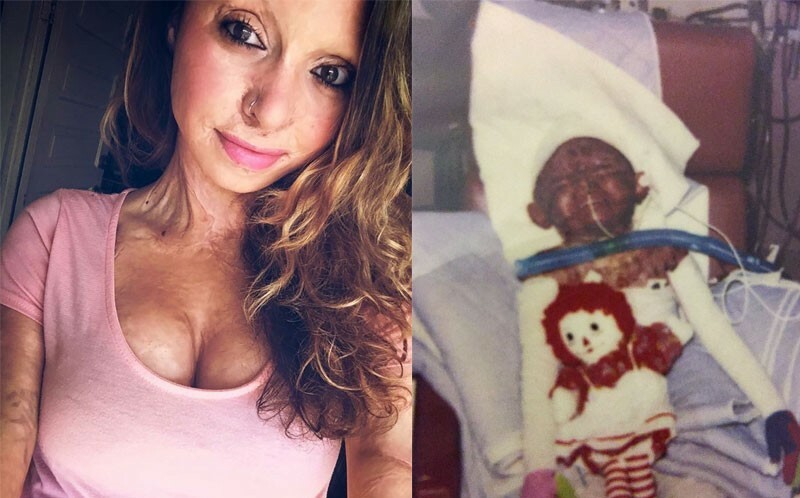 North Carolina native Harley Dabbs was two years old when a house fire left 85% of her body covered in burns. Despite her horrific injuries, she defied medics who believed she only had a 2% chance of survival. For 18 years Ms Dabbs has undergone skin grafts and surgeries at Shriners Hospital for Children in Cincinnati, Ohio. Here, she meets other burn survivors. 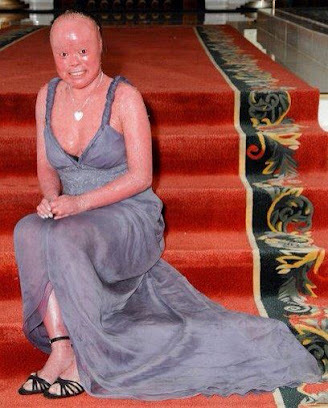 Her badly scarred skin made her a target for bullies. As a teen, she struggled with depression and suicidal thoughts. 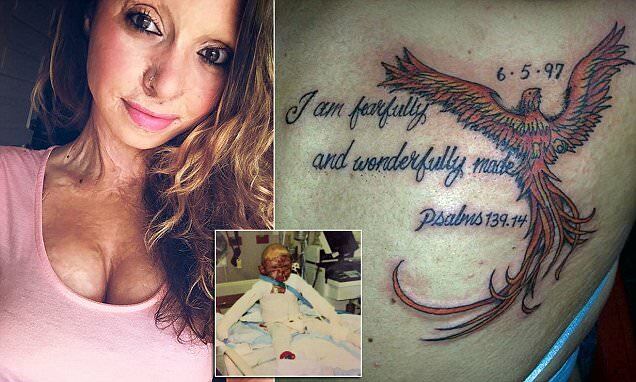 Now 21, Dabbs has beaten her demons and got a phoenix tattoo to mark her personal change. 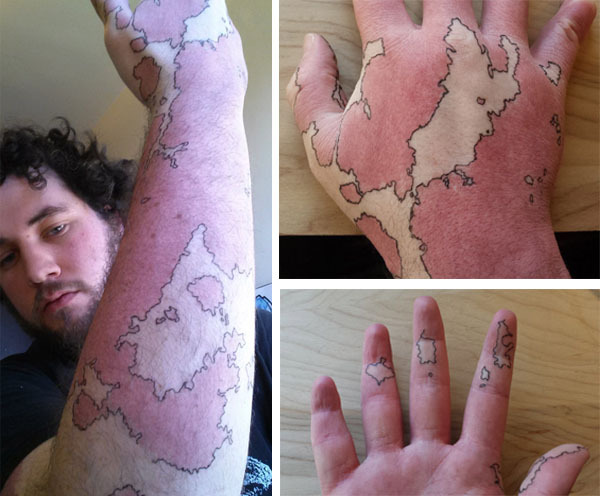 Redditor Mneneon is a New York college student called Jacob who has transformed his birthmark, which covers his right hand and arm, into a map of an imaginary world. Instead of covering up the red patches (which resemble little islands and vast continents), he likes to draw around them to create borders. The images have been shared thousands of times. Jacob says he’s always seen his birthmark as a map—he believes the red skin is land, and the white is ocean (at least on his hand). It takes around about an hour and a half to draw the whole map. When asked if he’s ever considered turning his artwork into a permanent tattoo, he said he’s not sure he wants to.